Nestled in the forest on Sulphur Mountain, with a view through the trees overlooking Banff’s townsite, sat the Alpine Club of Canada clubhouse headquarters. Built in 1909, the clubhouse became a summer base camp for members of the Alpine Club of Canada, as they ventured out and returned from expeditions through the Rocky Mountains. The club had been formed three years earlier amidst growing interest in the Rockies’ potential for mountaineering, and with the support of the tourist-minded Canadian Pacific Railway. By the 1920s, the clubhouse had grown to include a permanent dining room, and modern wooden cabins were built to replace the tent quarters in the trees. Legendary Canmore-based alpinist Lawrence Grassi created a network of steps and paths connecting the cabins, and built a trail extending from the camp site up Sulphur Mountain. In 1926, the camp was connected to the town’s electrical grid, and lights were installed in the clubhouse, the cabins and on the grounds. For the next 40 years, the clubhouse hosted locals notables including club president A. O. Wheeler, co-founder Elizabeth Parker and club photographer Byron Harmon, visiting alpinists from across the country, as well as regular lectures, meetings, and socials. Today, you might only find the camp site if you know where to look. Its former driveway off Mountain Avenue is inconspicuously marked by three large boulders, preventing vehicles from turning off. 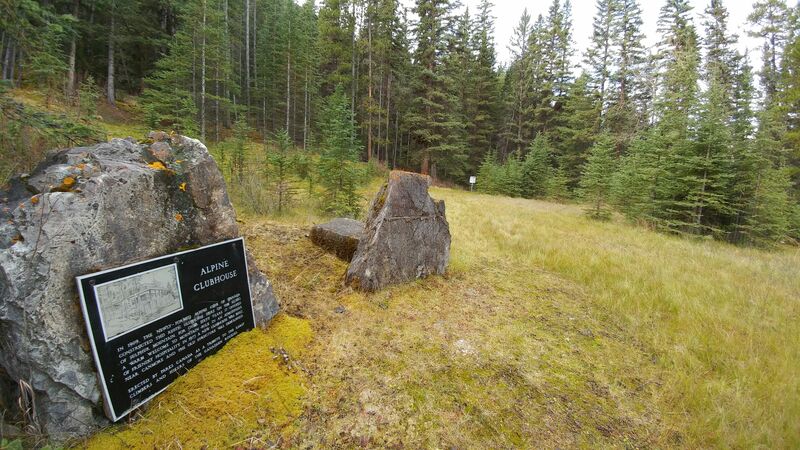 If you travel briefly past the boulders along a grassy former road, you arrive at a clearing, marked only by two large rocks and a brief plaque commemorating the Alpine Club of Canada clubhouse. The clubhouse was demolished in 1974, after years of deterioration forced the Club to build new headquarters in Canmore. The Club’s proposal for a major redevelopment was denied by a Parks Canada administration that had come to recognize lower Sulphur Mountain as an ecologically sensitive area, and that could not condone the expansion of a private organization’s land outside the town. But there are clear remnants of the former buildings on site. There’s a broad clearing where the clubhouse itself was formerly located, and a tangle of small paths reaches upward toward smaller flat clearings that would have held cabins in the trees, up the mountain behind the clubhouse. Today, even as the original camp site is becoming renaturalized, the Alpine Club of Canada continues to foster a national mountaineering community based in the Canadian Rockies.